Here’s a quick and easy Passover-friendly dish that my family loves. 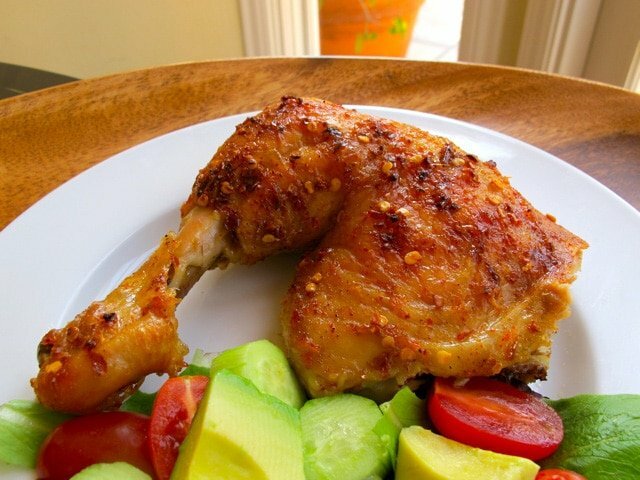 This simple marinated chicken is infused with the flavor of lemon, garlic, and chili powder. 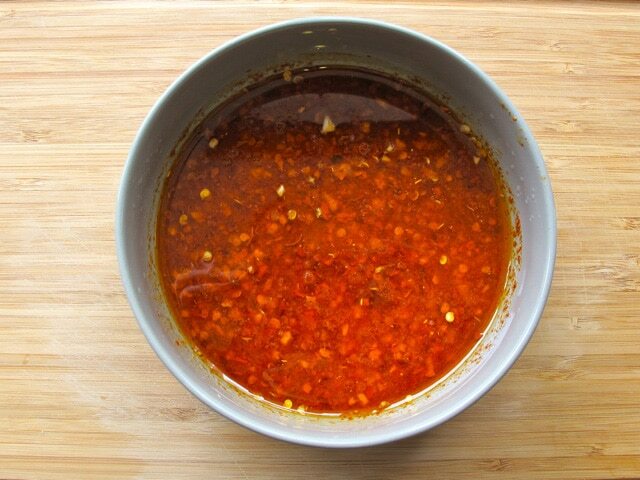 Chili flakes add a touch of heat; you can add more or less depending on how spicy you like it. As written, the spice in this chicken is fairly mild. 4 tsp of chili flakes would make it spicy. If you’re super sensitive to spice, just use 1 tsp. I prefer bone-in chicken pieces; roasting them in the marinade produces a tender, juicy result. You can debone the meat after roasting if you prefer. And yes, folks, it’s gluten free. Enjoy! A simple and delicious recipe for roast chicken marinated in lemon, chili and garlic. Gluten Free, Kosher for Passover. 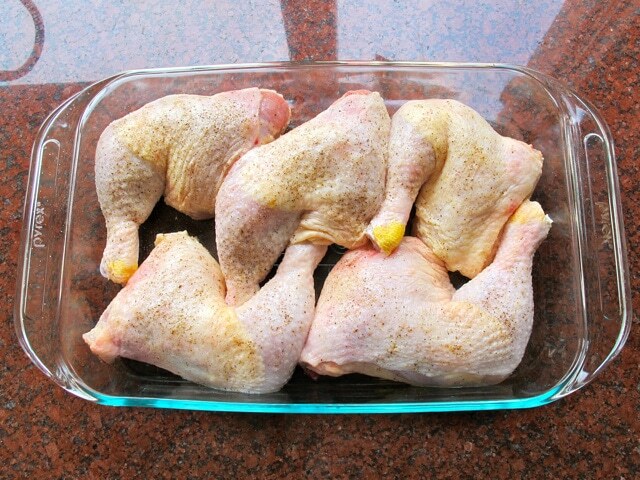 Place chicken pieces in a single layer on the bottom of a roasting pan or dish. Sprinkle pieces generously with salt and pepper. In a small bowl, zest the two lemons. Cut them in half and juice them into the bowl. Add olive oil, garlic, chili powder and chili pepper flakes. Whisk together all ingredients till well combined. 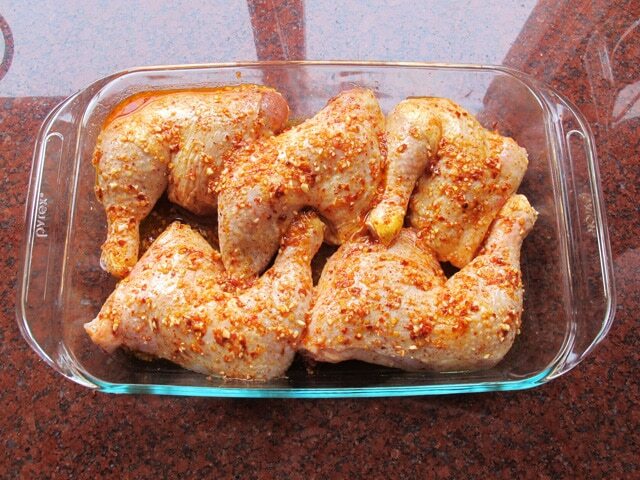 Brush the chicken pieces generously with the marinade till evenly coated. Pour remaining marinade over the top of the pieces. Cover the dish with plastic wrap and refrigerate for 2 hours (no longer, or the acid in the lemon juice will break down the chicken meat). 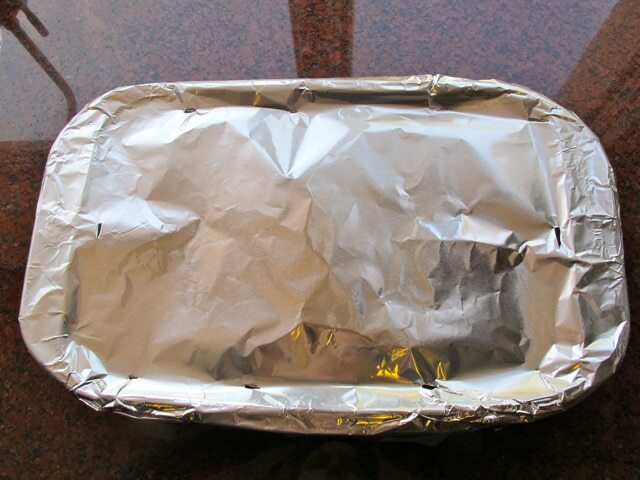 Preheat the oven to 375 degrees F. Remove the plastic wrap and cover the roasting pan or dish tightly with foil. Cut a few slits in the foil around the edges to vent. Place chicken in the oven and cook for about 1 hour, until the juices run clear and internal temperature reaches 170 degrees F. Remove the foil and raise the oven temperature to 425 degrees F. Cook the chicken for about 10 more minutes until it is nicely browned and the skin is crisp. I have been making this dish for years now. It became “my” regular shabbat dish and everyone loves it. Thanks! I wasnt clear on what you do with the lemon zest? I’m assuming mix into the marinade? Hi Eli– place the lemon zest into the bowl with the lemon juice, olive oil, garlic and spices. Hi Frank, great question. Marination stays the same, you could cut it down to 1 hour if you’re in a hurry (definitely no more than 2 hours). You might want to cut the amount of lemon juice in half in the marinade, since breasts tend to soak up flavor more and they might be a little too lemony (unless you totally love lemon). Then you can grill the breasts, or bake them in a foil covered dish as directed in the recipe, but cut baking time to 30-40 minutes until chicken is cooked through and juices run clear. If you bake, turn the breasts once and baste them during the cooking process. If it looks like the liquid is drying out or the meat looks dry, baste with olive oil. You could also try broiling them, but the garlic pieces and the chili will blacken faster than the rest of the meat, so make sure the meat is placed several inches from the broiling element. Good luck! There are a number of recipes on the internet, but they are all basically the same. (Some leave out the wine vinegar, but I think it is essential). The basic recipe is so simple (which makes it easy to make even if you are busy). Combine liquids and sugar and bring to a boil. Lower heat and simmer five to ten minutes. Pour the sauce over the chicken in a baking dish and bake in a preheated oven at 350 for about an hour. I usually baste it half way through. I live in Reno NV where can i find kishka? Google Israeli coffee chicken – it’s on there. This looks wonderful! I wonder if it would be too spicy for the kids though. I love seeing new chicken recipes. Have you tried Israeli Coffee chicken? It is a Friday night staple in our house. Hi Francine! The spice is actually very mild. Try it with 1 tsp of chili flakes if you’re worried about the kids thinking it’s too spicy. I’m not familiar with Israeli Coffee Chicken, I’d love to hear about that one! Love it! I’m trying to learn as many recipes, history and traditions as I can as I enter into a new life with the most wonderful man on the planet!!! Thank you SOOOOO much for such a terrific site. I made the Aromatic Lemon Chili Chicken last night and served it with homemade apple sauce, potato latkes, and matzo ball soup. Everything was wonderful. First time my husband ever had matzo ball soup was last night which amazed me because we have been married for 28 years! I cannot wait to try as many of these Passover Sephardic recipes that I can! Thank you so much for posting these! Tori- would I make this recipe the same if I were to use boneless skinless chicken breasts? Hey Bronwyn– you can marinate it the same way, but boneless skinless breasts cook much faster than bone-in chicken. I would suggest cooking it by grilling rather than roasting for more flavor. Use a grill or grill pan and cook for 10-12 minutes total (5-6 minutes on each side) or until cooked through. If you prefer to cook them in the oven, bake in a foil-covered roasting pan in the 375 degree oven for about 20 minutes or until cooked through (always use a meat thermometer to check for doneness). You can broil them, too. Don’t overcook them, or you’ll end up with dry meat. Smaller breasts may cook even faster. Good luck! I’m sitting here doing my second seder planning- sounds perfect. Question- looks like you used only dark meat. How is the cooking time if I’m using a whole cut up chicken- or it white meat likely to be too dry with this? Thanks. Ilana- a whole cut up chicken works fine, I do it that way sometimes. The cooking time is about the same. The olive oil, marination, and foil covering helps add moisture to the white meat, so no worries about that. As long as your pieces are bone in, skin on, it should turn out great. Enjoy! I adapted it! I used half the lemon items as hubby isn’t too keen on things being too lemony. Poured it all over the whole chicken, but the lemon inside the clucker along with a few sprigs of sage. 5 hours on low in the crock pot. I added a few little potatoes the last hour. Everyone loved it! Thanks so much for sharing Tori! This looks delicious! Keep the Pesach recipes coming, my sister, mom and myself are sharing the cooking this year and it’s always great to make something different. Do you have a yummy recipe for a sephardic charoset? That looks amazing! I was just thinking about how I might roast my pasture-raised chicken this weekend for guests. The idea of cutting up the bird, marinating and roasting appeals to me more than roasting and then carving. Thank you! Oh Tori, I think I’m gonna adapt this for a whole chicken in my crock pot. So far every item I have prepared that you have shared has been SO awesome….I’m feeling brave in adapting! Leigh, I’m so pleased that you’ve enjoyed the recipes so far. Let me know how the crock pot adaptation turns out, I’d love to hear about it! This looks terrific! I will make all year, forget just for the seder! Hi Tory. Love the recipe and I will definitely try this one. Very easy and it sounds yummy. My only question is where you say “Sprinkle pieces generously with salt and pepper”. I have always used very little salt with Kosher chicken as it keeps some of the salt used in kashering. What do you think? Hey Phil! Glad you like this one. I’m a salt girl, I absolutely love it. I make the recipe this way using kosher chicken and the saltiness is just right for my taste (when combined with the other spices). For those who are sensitive to salt and using kosher chicken, they may wish to “lightly” salt rather than “generously” prior to roasting. Your guests can always salt it more at the table if they want to. Enjoy!